You are here: Home / Latest News / News / Deadline To Apply For $50,000 Accessibility Grants Is April 27, 2015. Deadline To Apply For $50,000 Accessibility Grants Is April 27, 2015. 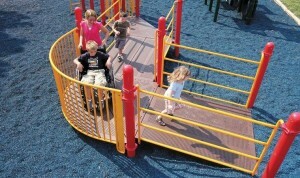 The Canadian government’s Enabling Accessibility Fund (EAF) is encouraging organizations to apply for grants of up to $50,000 for projects that improve accessibility in community facilities across Canada. The current deadline for submissions is April 27, 2015, and priority is given to projects that enhance access for children with disabilities (e.g. outdoor playgrounds, building accessible playgrounds for children with disabilities,…), veterans with disabilities or seniors with disabilities. Ben Lee Park Playground in Kelowna, BC, is receiving $50,000 from the EAF and the City of Kelowna is matching those funds for a total of $100,000. This funding will increase accessibility by adding equipment, expanding sidewalks and replacing wood fiber replaced with a rubberized surface. These changes will update the beautiful, accessible KidBuilders™ Fire Truck structure from PlayPower Canada and make the park even more inclusive. For more information on Ben Lee Park, click here for the news story. To apply for Enabling Accessibility Fund (EAF) grants, click here to go to the federal government site. 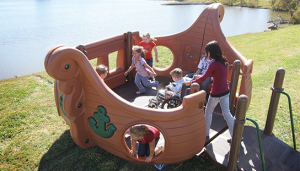 World Autism Awareness Day – April 2, 2015 Inclusive 8 Person Teeter Totter! New From PlayPower Canada.